If you are looking for some ammo that offers quality and performance with out a premium price tag, look at these PMC 44 Special rounds. This particular ammo is equipped with jacketed hollow point bullets and has a muzzle velocity of 890 feet per second. These hollow points offer controlled expansion and greater stopping power for self defense and hunting applications. Whether you are looking to volume shoot, or stock up on hollow points, this 1000 round case of 44 Special ammo is your ticket. Precision Made Cartridges, or PMC, ammunition is manufactured in South Korea. They manufacture a wide variety of small arms ammunition as well as large howitzer rounds for the South Korean military. PMC manufactures all of their components from raw materials so that they can control the quality in their supply chain. 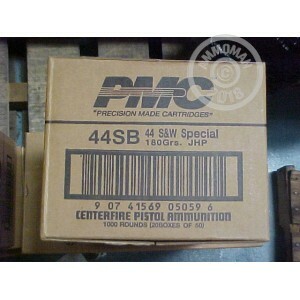 Order this 1000 round case of PMC 44 Special ammunition today and we will ship the ammo to you for FREE!